One of the Largest Powder Coating Ovens in O.C. 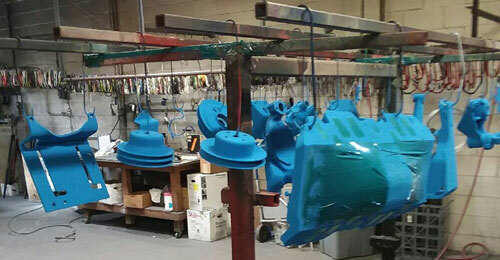 Orange County Powder Coating is Orange County’s best choice for exceptional, cost-effective powder coating services. We are a local, family-owned company with over 60 years of combined experience in resurfacing and powder coating. At our powder coating facility in Orange, we’re able to handle residential and commercial projects of all sizes, from a single piece of patio furniture to a full production run of aluminum door frames. Our team of powder coating experts are dedicated to delivering exceptional customer service and unparalleled workmanship for every order. As a testament to the quality of our work, we have tens of thousands of satisfied clients, and regularly work with private individuals, interior designers, contractors, engineers, and commercial businesses throughout Anaheim, Fullerton, Yorba Linda, Huntington Beach, Irvine, Tustin, Santa Ana, and surrounding areas. 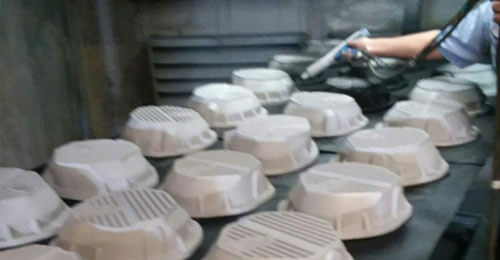 With Orange County Powder Coating, you’ll work with professionals who have the skills and expertise to ensure that your powder coating job is done right, the first time, every time. With years of hands-on experience and training, our staff are well-versed in the attributes of all the different kinds of composite metals we powder coat, including aluminum, steel (copper plate and buff), magnesium, stainless steel, pot metal (die cast), brass, and tin. They are experts at interpreting engineering specs, and will know exactly what type of abrasive blasting and powder coating will be necessary to achieve the best results. And because we’re able to handle the entire resurfacing and powder coating process in house, we’re able to ensure that the industry’s best practices are applied. 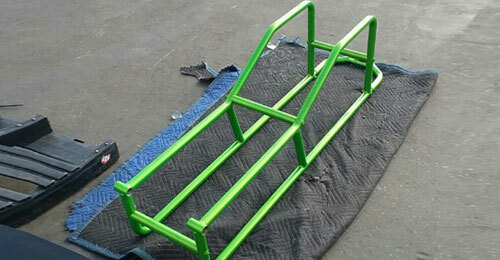 The end result is a flawless, long-lasting, and color-fast powder coat finish. 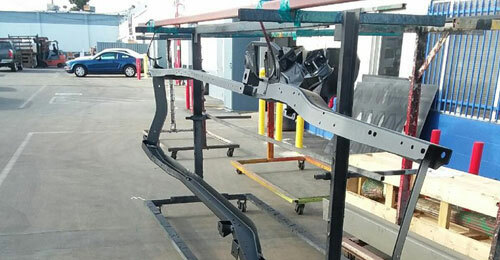 Our state-of-the-art shop is equipped with an 8’ x 8’ x 20’ powder coating oven, one of the largest in Orange County, capable of handling oversize items, such as street lights, to large commercial production runs of metal signs, window frames, or machine parts. We also have multiple powder spraying and blasting booths and high powered equipment, which gives us the capacity to complete most powder coating jobs entirely in house. Additionally, we stock one of the largest selections of powder coating colors in the industry, including popular "candy colors." Call Us Today for a Consultation & Estimate. We Stand Behind Every Powder Coating Job. At Orange County Powder Coating, customer satisfaction is our number one priority. 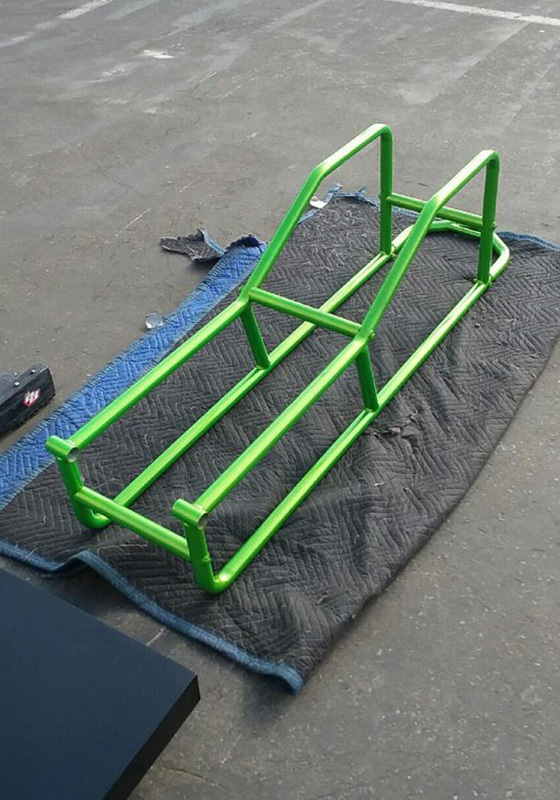 We will go the extra mile to be sure you are happy with our powder coating services, and stand behind our work with our "no attitude redo program." If there has been an error on your order and we determine that we were at fault, we will correct it for you free of charge. Call or stop by our shop in the City of Orange today to speak to one of our friendly and helpful staff. We are happy to provide free quotes on any size order, and can provide an on-site assessment if necessary. If you need help choosing the best color for your project, we can provide free samples, or we can special order any color we don’t have on hand. Delivery and rush order services are available upon request. Color on screen is for reference only. Please request a sample for approval. This place is simply awesome been coming here for high quality powder coating and chrome. Thank you Dan, your the man!